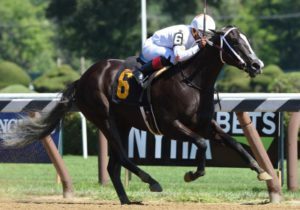 John C. Oxley’s Catherinethegreat was hustled to the front at the start of the $150,000 Schuylervillle Stakes (G3) on Opening Day at Saratoga, led through a quarter in :21 3/5 and a half in :44 3/5, then drew away down the stretch to a 4-1/2 length victory in 1:09 4/5 for six furlongs. Fellow OBS graduate Congrats Gal (October ’17, April ’18) checked in third. It’s the second straight victory for the 2-year-old Florida-bred daughter of Uncaptured, who came into the race off a 10-1/4 length score at Gulfstream. Consigned by Turtle Pond Farm to the 2017 OBS October Open Sale of Yearlings, she was purchased for a sale topping $170,000. 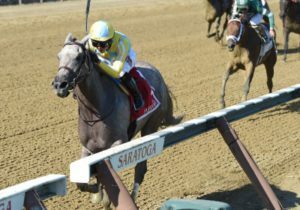 Now 3-2-1-0 for trainer Mark Casse, she has earned $136,300 to date.